A full and fair representation. No property qualification of members for the Legislative Council. 'The charter was written by members of the Ballarat Reform League in 1854. It contains their passionate demands for more people in the colony of Victoria to have greater involvement in making laws in Victoria, such as having the right to vote, and to stand for parliament. The charter also stated that the administration of the goldfields and the colony’s police service and justice system needed to be improved. The Ballarat Reform League Charter was successfully nominated for the Australian Memory of the World Register in 2004. 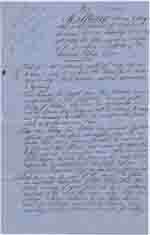 This four-page handwritten manifesto of democratic principles and demands was presented to Governor Hotham in November 1854. Anne Beggs Sunter, The Ballarat Reform League. A History. The Ballaarat Reform League and the events of Eureka were central to the development of Australia as an independent democratic country.